Don't forget to RSVP by July 31st for this exciting event! Sephora always has the best beauty events and I'm super excited for this one! I have a few beauty items (face masks, lipglosses, a setting powder, maybe a fragrance or two...) on my "WISHLIST" that I've been wanting to get so I'll definitely have a great excuse to purchase them now. HURRY-SPACE IS LIMITED. RSVP By friday, JULY 31, 2015. Can’t make it? Enjoy 4x points on all purchases online and in stores during Beauty Insider Appreciation Week, August 3-August 9, 2015. * Select Sephora stores will have different hours; only select Sephora inside JCPenney stores will have closed-door shopping events. Check the RSVP Site for participating stores and exact times. 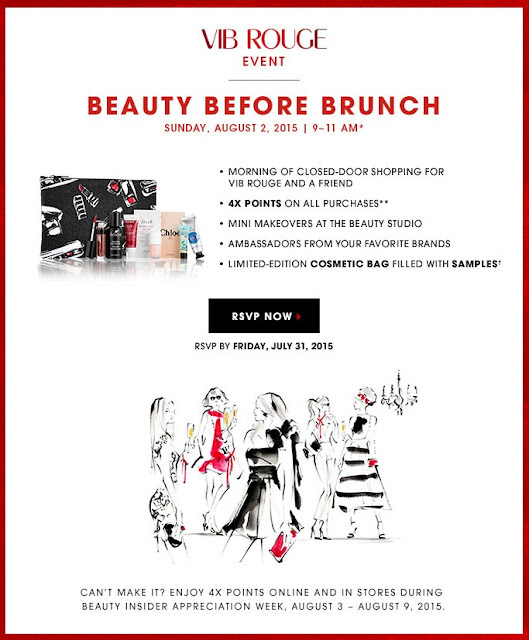 ** Qualified VIB Rouge will earn quadruple points, VIBs will earn triple points and Beauty Insiders will earn double points on merchandise purchases made Sunday, August 2, 2015 thru Sunday, August 9, 2015 at 11:59pm PDT. Bonus points will be automatically credited to your BI Accounts the same day of purchase. Points not earned on sales tax, shipping, Sephora gift cards, eGift cards and prior purchases. This offer is subject to change, alternation or termination by Sephora in its discretion at any time. † The Sephora Cosmetic Bag with samples is only available to VIB Rouge members in select Sephora stores during the Beauty Before Brunch Event with any merchandise purchase. Limit of one of each offer per VIB Rouge client. May not be sold or otherwise transferred. Guests of VIB Rouge that are Beauty Insiders are also eligible to redeem the Sephora Cosmetic Bag with samples with any merchandise purchase, limit one per client. Valid while supplies last, quantities are limited, sample bag assortment may vary. Not valid on previous purchases, or purchases of eGift certificates and gift cards. Sephora employees are not eligible for offers. No returns or exchanges. These offers are subject to change, alteration or termination by Sephora in its sole discretion at any time.